Everything you need to find your way here, find your way around the venue, and find games or players! Need help finding your way here? We are here to help. General Admission tickets are available at a discounted Early Bird rate until one month before the event. Get yours here to save yourself money and help us hire the venue. Online tickets are available for another two weeks at a slightly higher rate. Some door tickets are always available if you aren't able to pre-order - cards are preferred, cash still accepted if you must. If you can't afford your ticket, you could either work for us or try your luck at the door for any free tickets our generous friends sometimes donate for anyone genuinely struggling. Blackheath Community Centre is less than 5mins walk from Blackheath train station. If we hear of any surprise trackwork causing service interruptions, we will post it here. You can check yourself via this link. THE LAST TRAIN BACK TO Sydney LEAVES AT 10:10 pm. Driving here? We are under 2hrs drive from Sydney, 1hr & 15mins from Parramatta, 1hr from Penrith, half an hour from Lithgow, about an hour from Bathurst, under 2hrs from Orange. Parking around Blackheath on a Saturday? It's not bad. We'd love to suggest certain spots, but if you respect the signs, you'll avoid any fines. Summer 2018 will be our first time at the Blackheath Community Centre. Should you have any specific questions, requirements or comments regarding the venue, please speak with the door staff or email us via [email protected]. We're currently in talks with venue management and council about installing a wheelchair ramp for the internal corridor, but if you require assistance accessing the second hall, door staff would be happy to open auxillary doors for you during the event. Most gaming areas and two bathrooms are wheelchair-accessible. This building has baby change facilities! Some food options exist within the venue, and many others just around the corner. Water dispensers will be refilled regularly, but in the interest of the environment, please bring your own water bottle to reduce waste. There are heating systems for the cold months, just let us know if you're uncomfortable and we'll try our best to keep everyone equally at ease. Please refer to our Code of Conduct for general rules for attendees, and see below for a guide to the various activities available. If any of the above situations apply to you on the day, our table signs can usually help. Keep your eyes peeled for them on existing tables around the venue, and feel free to grab one from the pile near the games library. They are there to help you! If you're looking for players, put this on your table! If you're looking for a game, head toward the green sign! Struggling with an unfamiliar game or rule? Put this yellow sign on your table. If you see someone with this sign and you believe you might be able to help, please offer them your assistance! The blue sign means that someone is teaching a game by playing it for an audience. Feel free to watch, ask questions, or ask if you can play along! Need tickets, or just want to look at the prize pile? Purple sign. The orange sign is a table reserved for a prize-winning tournament! If you'd like to sign up in person, please register with the door staff at least an hour before the competition is due to begin. 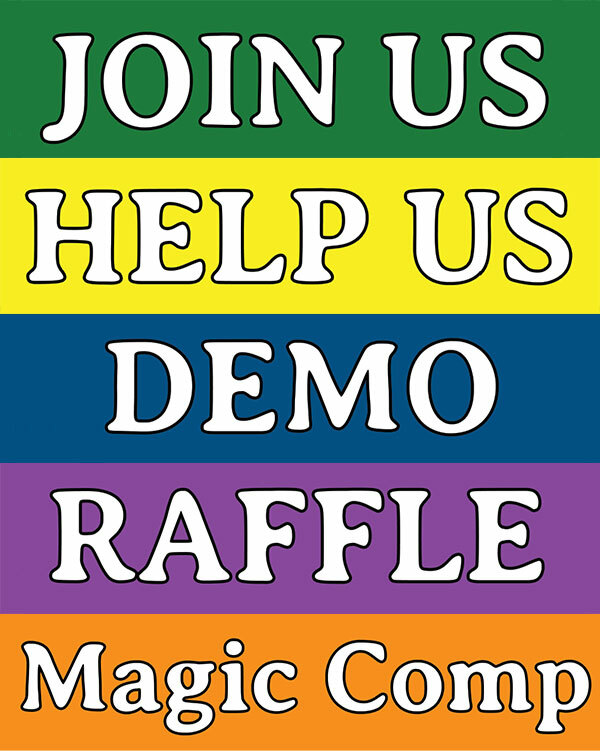 Ettin Con's games library is now publicly curated; The games are either on loan from your fellow attendees, vendors, sponsors, or were donated to (or purchased by) Ettin Con. Please scan each game out/in with library staff, don't simply grab and run. An overview of the library can be found here. Rules for the proper and considerate treatment of the games can be found at EttinCon.org/conduct/#gamesLibrary. Thanks for your help! Reserved seating sessions require registration. This can be done online by following the links at each listing via EttinCon.org/#games-listing until an hour prior to the commencement of each session. After that time, any last-minute seats will be posted on the noticeboard for collection. Competitions/Tournaments also require an entry fee, payable via the website until midnight prior to the event, or at the front desk on the day. 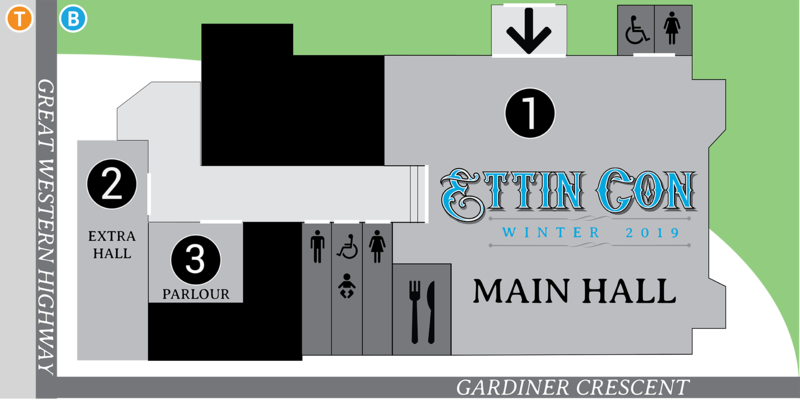 Our online timetable (plus map) is regularly updated on the home page, or at EttinCon.org/timetable. We also maintain a Google calendar and print limited copies of the timetable & map on the day. These are posted near the noticeboard in the main hall, and anywhere else we find useful. If you have any ideas to improve this page, or any feedback at all, please let us know via either [email protected] or the feedback form at EttinCon.org/feedback. We want it to be easy for everyone to find, and share, the kind of fun they are looking for on the day.